Web Design Leamington Spa : Public Marketing Communications : Twitter for business – what do I say and how? Twitter for business – what do I say and how? Before you start typing away about your latest offers, take a step back and consider your social media strategy. This needn't be a long and drawn out process. We've written a blog post with some tips to point you in the right direction. Now you know why you're doing it and who you're talking to, it's time to get tweeting. Don't forget that Twitter is fast-paced. People usually skim-read the thousands of tweets that pop up in their news feeds every day. Try to make yours stand out. If you worked hard on a blog post or are proud of your new product or service, don’t be afraid to tweet about it a few times. When you repeat your tweet, make it different - don’t tweet the exact same words every time. Using a hashtag is as simple as adding the ‘#’ sign before a single word or phrase without spaces. If you tweet with a hashtag, anyone who does a search for that hashtag may find your tweet. Remember: don’t over-tag a single tweet and use hashtags only on tweets relevant to the topic. By tweeting about a trending topic you give your tweet greater exposure than it typically will receive. Getting retweeted is an excellent way of extending your influence on Twitter. Retweets can lead to more followers, more traffic to your website, and more publicity for your business. Twitter's own research has proven that including an image with your tweet increases engagement (i.e. more people will see, click on and retweet your tweet). This isn't essential, but if you include a link to your own website (especially a relevant page) this can drive more traffic to your site. Use a URL shortener like bit.ly to save space – you've only got 140 characters. If you use a scheduling tool like Buffer, the system will automatically shorten any URLs for you. It sounds obvious, but with over 300 million users worldwide (and growing), there is plenty of other noise on Twitter so you need to be persistent to make an impact. Out of common courtesy it's worth taking the time to say thanks if people mention or retweet you. Also they will be more likely to retweet you in the future. Help others get their message out and they will be much more likely to do the same for you. If you include the Twitter user name of others in your blog post, they'll be notified that you mentioned them. There's a good chance they will retweet your post when they find out they are in the post you are sharing. This often works for big brands too – but only if you say something nice about them! We use Buffer and Hootsuite to schedule our social media posts at the optimum times for ourselves and our clients. Scheduling your tweets in this way can help your content get maximum exposure. If you focus too much on “me” and “my business”, tweets can resemble pushy sales pitches. Of course you need to talk about yourself, but remember that Twitter is a social platform so people will lose interest if it's only ever about you. The better the prize you are willing to give away, the more likely people are to retweet your link. And if you offer a free online course, eBook, or digital content, you are more likely to get engagement. Installing a Twitter button onto every page or blog post on your website makes it easy for people to share your content. You can get one from Twitter and you'll probably be able to do this without your web developer's help. 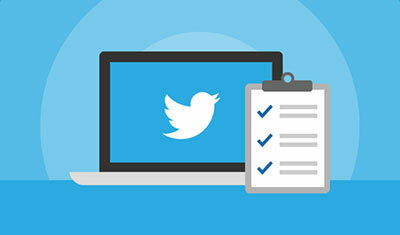 Use Twitter Analytics to find out what you're doing right (and wrong). You can drill down into the data to find out what's working best for you. As well as managing our own social media accounts, we do it for other businesses. Contact us to find out how we can save you time and help get your business found online.